Camp Woodland | More Than a Camp Meal – It’s Food For the Body & Soul! 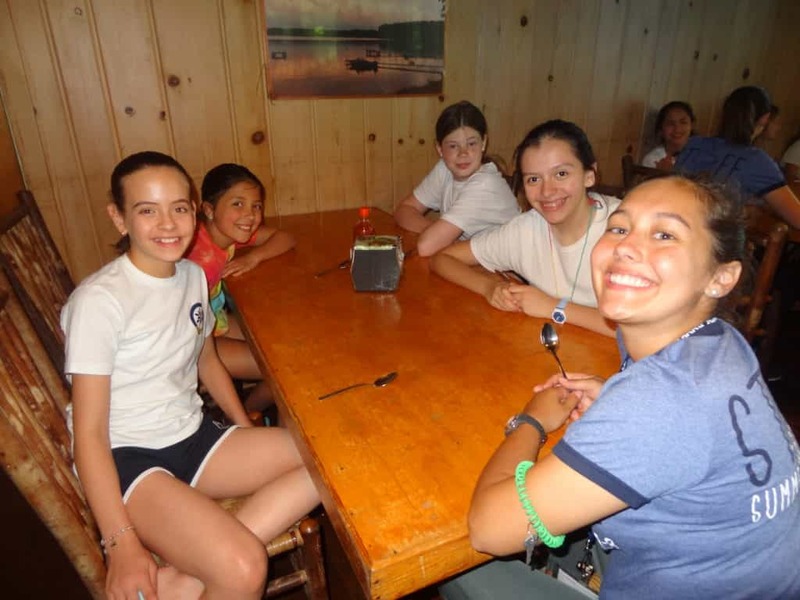 More Than a Camp Meal – It’s Food For the Body & Soul! Thinking back to when I was a kid, I can remember how important eating dinner together as a family was to my parents. Even though my Dad had a business to run and my siblings and I had sports practice, games, homework, piano lessons, and a number of other things I probably don’t even remember, rarely a day would go by when we didn’t sit down as a family for the evening meal. My Mom did everything in her power to work around our busy schedules so that we could share time together around the table most nights until I graduated from high school. What I know now that I didn’t know when I was still living at home, it that there are numerous positive outcomes that come from bonding over a meal. Just the mere act of coming together and TALKING with one another is food for the soul. Breakfast is usually a little more quiet than the other two meals (as you might imagine, pre-teens and teens are not fully awake just yet – unless it is Saturday which means DONUT DAY! 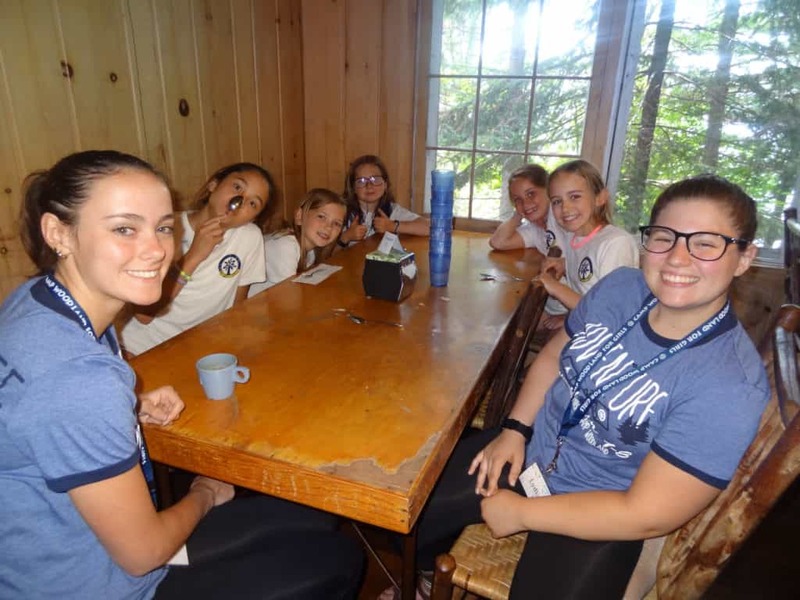 ), but there is the anticipation of an exciting day ahead while campers discuss what they are looking forward to with each girl’s schedule of activities. Today could present the opportunity to canter for the first time in riding, learn to dive in swimming, practice a dance routine for the upcoming show, or enjoy making a picture frame in arts and crafts. Come lunch time, the dining room is filled with non-stop chatter as campers take turns giving a blow-by-blow recap of their morning and all that transpired in the past few hours. The volume has definitely increased since we were last together, and the energy has more than quadrupled (if I had to wager a guess!). 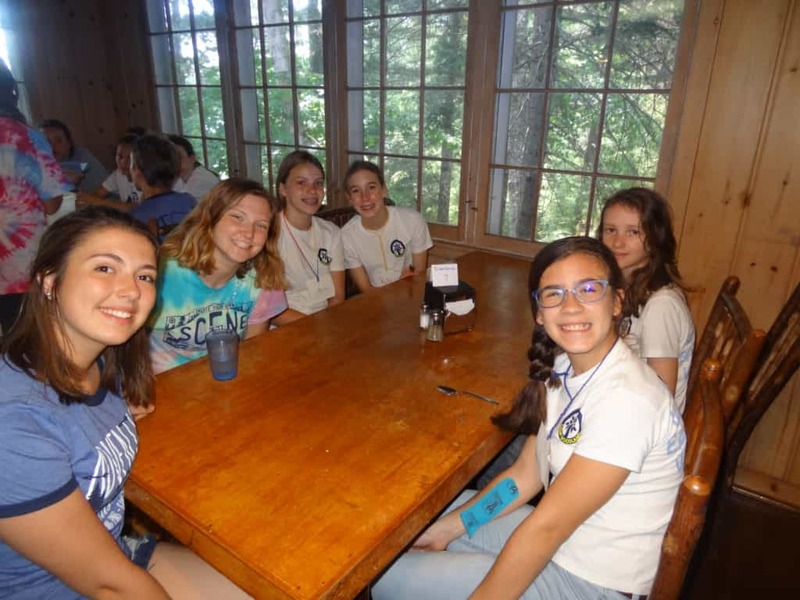 Having a good chunk of time to sit around a table with your cabin offers an incredible opportunity to share thoughts, ideas, goals, dreams, stories, and more with the people you are getting to know in a group living setting. 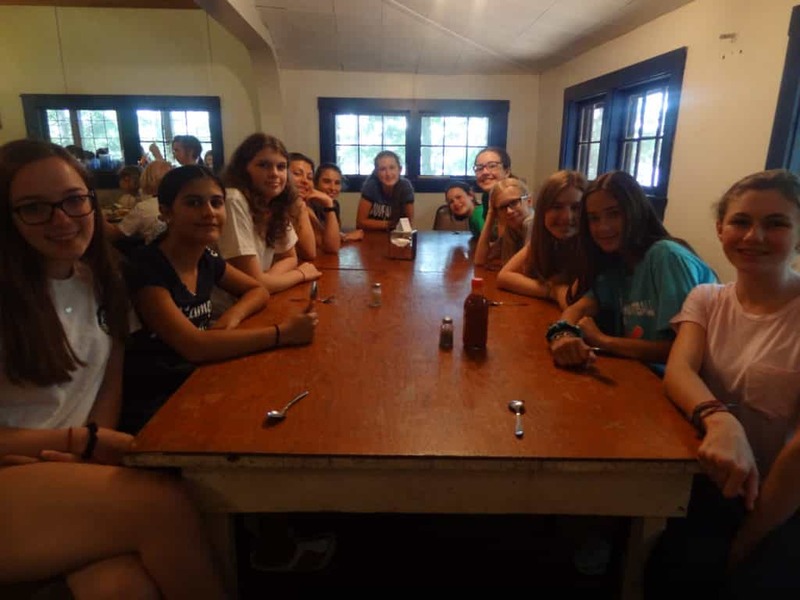 In just a short period of time, campers feel comfortable and safe to be transparent and real in these conversations while enjoying a meal together. When assembly rolls around following an afternoon of more fun and adventure, we once again file into the lodge for our 3rd meal of the day. Some cabins sit in the “front” part of the dining room, while others gather in the “back.” Both locations have their advantages! Having a table in the front means you are close to the awesome fire that Chet builds many mornings (a plus when the air is a bit “crispy”), and being in the back means enjoying a view of the lake along with a refreshing breeze (if the weather calls for the windows to be open). I vividly remember sitting at a table in the back as a counselor and getting to see an eagle perched in the giant pine tree right outside the door. What a treat to have such a majestic creature join us! 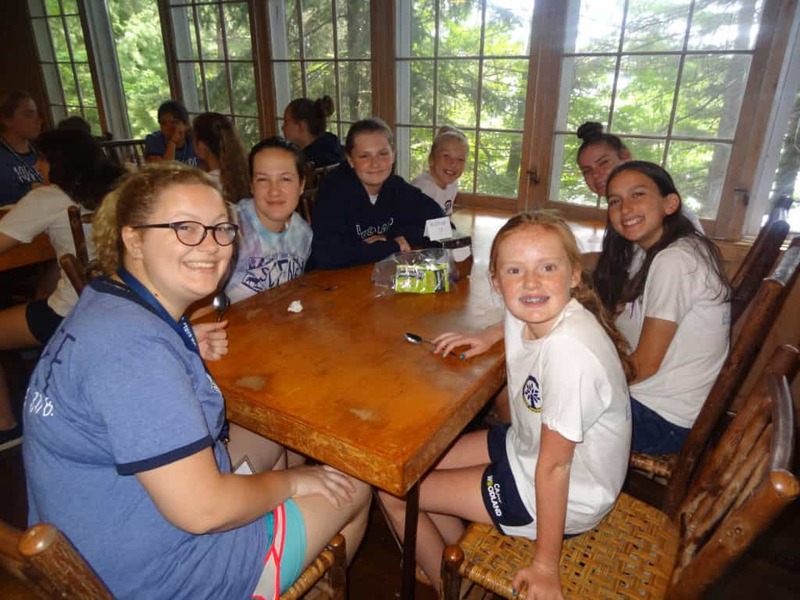 After the evening meal and another opportunity to check in with each other about afternoon activities and accomplishments, the CIT’s pass out song books and we enjoy time to sing together as a camp community. Some songs tell a funny story (Ship Titanic), while others have motions (A Boy and A Girl in a Little Canoe) or offer a chance for the front and back dining rooms to sing in a round (Zoom Golly-Golly). We wrap up this camp tradition every night by singing two legendary Woodland songs (W – That’s the Way it Begins… and We Are From Woodland, Woodland Are We…). Another benefit of eating 3 meals a day together is that we take the time to SLOW DOWN and ENJOY each other’s company, which is a rarity in any other place. 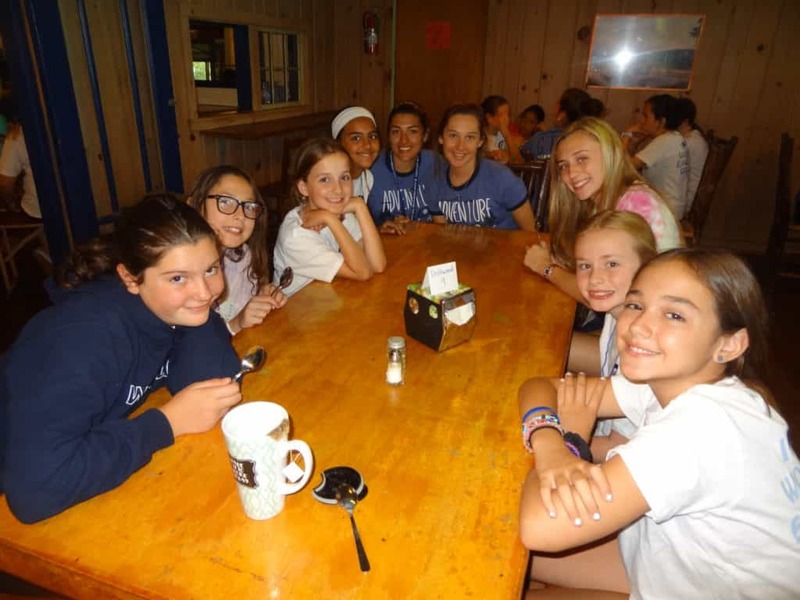 We are able to relax a bit, reflect on the experiences a camp day has to offer, and revel in the laughter and fun we share as a cabin group. Meal times are the BEST! p.s. I should also mention that the food at Camp Woodland is delicious! Most meals are served from “scratch” — don’t be surprised if your camper comes home with a few menu requests that are not your average fare!